TV with Thinus: Justice Malala the next eNCA exit as The Justice Factor gets cancelled after nearly 10 years. Justice Malala the next eNCA exit as The Justice Factor gets cancelled after nearly 10 years. 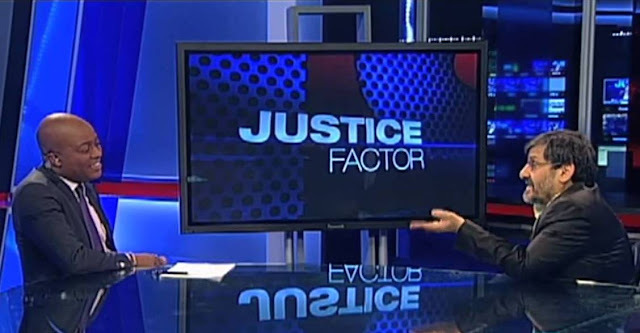 Justice Malala is the next high-profile exit from eNCA (DStv 403) with his long-running political interview show The Justice Factor that is cancelled. eNCA on late Monday afternoon abruptly announced five hours before The Justice Factor that Monday night's edition would be the last episode on the rebranded eNCA. The channel conspicuously left out the political talk show and Justice Malala when it announced its adjusted programming line-up and talent roster in mid-July a month after the channel's 10th birthday. Industry insiders have been buzzing for weeks that the well-respected political commentator is in the running and part of the shortlisted candidates to start a new TV news channel to rival eNCA and SABC News to replace Mzwanele Manyi's struggling Afro Worldview (DStv 405), formerly ANN7, that will be shut down on 20 August on MultiChoice's DStv satellite pay-TV platform. MultiChoice has however refused to announce the names of the shortlisted candidates for public scrutiny, with MultiChoice SA CEO Calvo Mawela who said the Naspers-owned pay-TV service plans to announce the winning local TV news channel bid before Afro Worldview's termination date. Justice Malala's eNCA exit after nearly a decade of hosting The Justice Factor with its "Loser of the Week" closer segments, is the latest in a flurry of well-known and respected on- and off-screen news and actuality talent that have left the eMedia Investment's Hyde Park hangout this year - some after having been at e.tv for many years. eNCA and e.tv defections have continued unabated in 2018, including senior reporter Karyn Maughan, political analyst Angelo Fick, anchors Marc Chase, Joanne Joseph and Ayanda-Allie Paine, eNCA's former head of current affairs, Debbie Meyers, and Phathiswa Magopeni who was eNCA's business and economics editor and head of terrestrial news services at eNCA. Over the past almost 10 years Justice Malala and The Justice Factor often created buzz-worthy moments with Malala's unrelenting probing of politicians who were willing to do sit-down interviews, as well as trainwreck spectacles with the likes of Hlaudi Motsoeneng. Justice Malala, well-versed in the visual power of television to demonstrate a point more powerfully than words can, in October 2013 drove home the shocking corruption and mismanagement in the South African government when the production crew bought R1 000 of KFC and stacked it on the anchor desk to show the shocking waste of the R53 000 in fast food including KFC that the then Northern Cape premier Sylvia Lucas bought during just 10 weeks in office using her government credit card. In a statement Justice Malala said "I started my TV career at e.tv and will forever be grateful to have been there 10 years ago to see eNCA being born and grow to become the national treasure it is today. It is a voice that has enriched this democracy and has become a pillar of our society. I have no doubt it will continue to be vigorous and to report without fear or favour. It is a voice that must not be stilled". Justice Malala will apparently be going overseas with his family for a sabbatical. Mapi Mhlangu, eNCA editor-in-chief and managing director, said "we would like to thank Justice for so many years of consistently great television. He has made an enormous contribution not only to eNCA but also as a powerful voice in the political landscape of our country. We wish him and his family all the best as they embark on this new adventure".